In nature, the way something looks can make it or break it. The Megalopygid Caterpillar has recently earned a new nickname, the Trump Caterpillar, because of its resemblance to Donald Trump’s iconic hair. 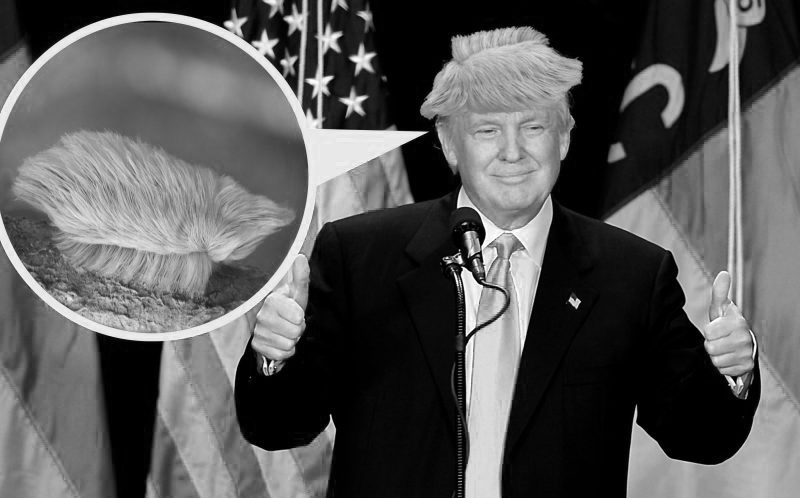 The Trump Caterpillar is found in the Peruvian Amazon and has a special survival strategy. Three main strategies of prey exist in the wild: camouflage, aposematism, and mimicry. While some species avoid being eaten by hiding in plain sight through camouflage, the Trump caterpillar survives by advertising its presence. But how exactly is this a good strategy? The Trump caterpillar’s orange/yellow hair is actually full of spines that contain irritating venom. Its bright and flashy appearance signals its predators to stay away. This is known as an aposematic signal. Predators evolve with their prey and other species around them, meaning that they know what the local toxic species are, what they can eat and what they can’t. In this case, the bright yellow/orange hair signals to all those who can see it, that this is a dangerous creature and to stay away. This strategy has been so successful in the Amazon, that other non-threatening species are mimicking the outward appearance of the Trump caterpillar, so as to trick their predators into thinking they too, are the poisonous creature. This is known as Batesian Mimicry. The Cinereous Mourner bird practices this mimicry. The adult birds are grey in color, but the chicks, are bright orange, just like the Trump caterpillar. The chicks even move like the caterpillar when startled, adding an even more complex level of mimicry in this species. Mimicry is especially popular with butterflies. A popular example is the North American Pipevine Swallowtail butterfly, that is so toxic that at least six other species of butterflies have evolved to mimic its wing color patterns. The female African Swallowtail takes on an even more complex mimicry. It has been known to mimic more than a dozen other butterfly species, depending on what the local toxic species is. Of course, a bird cannot look exactly like a caterpillar, but with Batesian mimicry, the disguise doesn’t have to be perfect, it just has to be good enough to trick the predators. So be careful out there in nature. If it’s begging for attention, it might just be best to stay away.